When kidnappers attacked a woman on a Guatemala City street and seized her baby daughter, DNA testing came to the rescue. The tests helped reunite the girl with her mother after the baby was left at a religious center with no identification. DNA testing has also helped connect legally adopted children with their biological parents and immigrants in the United States with their families. Now the technology is being used to bring together families separated at the U.S. border with Mexico. However, activists working for migrants say that using genetic tests in this way creates technical, legal and even moral problems. Leading migrant rights groups have been rejecting offers by companies to donate testing supplies for free. Genetic tests have helped an organization called DNA-Prokids reconnect more than 1,000 children with their families in Mexico, Nepal and several other countries. They also reconnected the mother with her kidnapped daughter in Guatemala City. Jose Lorente, a professor at the University of Granada in Spain, started the organization. Lorente said he was moved by the children he saw on the streets in cities around the world. Many were victims of trafficking and had parents who were looking for them. Lorente said he hopes to set up a worldwide network of DNA testing laboratories to help children everywhere. 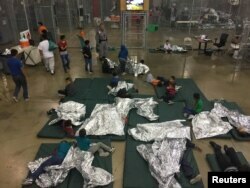 A view inside the U.S. Customs and Border Protection detention facility shows children at Rio Grande Valley Centralized Processing Center in Rio Grande City, Texas, June 17, 2018. Lorente said DNA tests could help make sure that children coming across the U.S.-Mexico border are not being trafficked. U.S. officials already use such tests to confirm that immigrants seeking to join family members in the United States are related. Genetic testing led the U.S. State Department to suspend a program for refugees in 2008. At the time, officials identified suspected cases of cheating in the government’s family reunification program. They tested about 3,000 people, mainly from Somalia, Ethiopia and Liberia. They confirmed a parental connection in less than 20 percent of the cases. The program restarted in 2012. It now requires a DNA test to prove that an adult and child are related. New technology could permit those tests to be done at the border in as little as 90 minutes. Currently, law enforcement agencies are examining DNA tests that can connect a person in police detention to a detailed computer listing of known criminals. The same technology could be used to test migrants. Thermo Fisher Scientific has offered to donate $1 million worth of its testing technology to help reunite families separated at the border. Two ancestry companies, 23andMe and MyHeritage, also offered to donate their genetic tests to the effort. Both companies normally sell their products to persons interested in family history. Yet migrant rights organizations are concerned about privacy. Fernanda Durand is with the migrant rights group CASA. She is worried that the government could use migrants' genetic information later without their approval. Normal DNA testing can only dependably identify parent-child and sibling relationships. In refugee situations, activists say, it is not unusual for someone other than a child's biological parent to care for them, especially when a parent has been killed or detained. Ancestry companies' tests can find much more genetic information than normal DNA tests, and can identify wider relationships. But they can also provide more sensitive information, including health data. These tests also are not certified for this purpose by the organization that oversees DNA testing labs. 23andMe and MyHeritage say they are concerned about privacy and will offer the tests only to legal aid groups working with migrant families. However, those groups are still not 100 percent sure of the services. Jennifer Falcon is with the Refugee and Immigrant Center for Education and Legal Services. She noted that separating parents from their children is bad enough. She added that you cannot solve one civil rights abuse by creating another possible violation of their privacy. Steve Baragona wrote this story for VOANews.com. Phil Dierking adapted his story for Learning English. George Grow was the editor. Do you think DNA testing should be used to reunite migrant families? Write to us in the Comments Section or on our Facebook page.